[CONT]:Sentinel [AUTO]:[Choose a card from your hand, and discard it] When this unit is placed on (GC) from hand, you may pay the cost. If you do, choose up to one of your vanguards that is being attacked, and that unit cannot be hit until end of that battle. [AUTO] Generation Break 1 Brave (This ability is active when you have three or less cards in your hand):When this unit is placed on (RC), until end of turn, this unit gets [Power]+2000, and "[AUTO](RC):[Counter Blast (1)] At the end of your turn, you may pay the cost. If you do, return this unit to your hand.". Royal's alternative PGG. As well as her standard Perfect Guard fare, she's got a Brave skill that activates when called. She gains 2k, and bounces back to the hand at the end of the turn...for a CB1 cost, anyway. Hopesong Angel fetches a Perfect Guard for the hand for emergencies, so she has some value in Brave decks as a 1-of, with the rest being Holy Knight Guardian, I guess? Anywhere else, I don't really enjoy the thought of eating my own resources for +0 washes unless they're high quality. At least she'll make 16k for a turn with Hopesong. 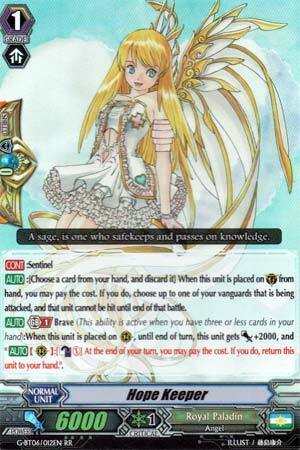 Actually not terrible in Sanctuary Guard as well as Brave decks owing to how she can be searched. Those are the most likely to use her in the most user-friendly manner. Apart from that, it's a Perfect Guard. Not much to say. And a Sentinel that can be used as an Emergency Booster when your hand is low on cards, so you can boost and return it to the hand. ...If you have to use a Perfect Guard as a booster, you're either way ahead and pushing for game or so far behind that it's all you can do to have a chance to win.